Next Monday is Columbus Day, at least in Arkansas and most other states. It’s not a day celebrated by everyone, particularly the descendants of the first nations who saw their populations decimated by the onslaught of Europeans that Columbus is given credit of opening the gate for. Five states do not recognize Columbus Day: Hawaii, Alaska, Oregon, South Dakota and Vermont. Three of those states will commemorate something else on Monday. Hawaii instead celebrates Discoverer’s Day, which commemorates the discovery of Hawaii by Polynesian explorers. South Dakota will have Native American Day. Vermont and Alaska will mark it as Indigenous Peoples’ Day. Oregon will not have any sort of public recognition at all. There are also a variety of different names given to it by city and tribal governments throughout the U.S. Many people grew up seeing Christopher Columbus as a hero. After all, he didn’t only discover America (if you disregard that the ancestors of American Indians and Vikings who “discovered” it before him) but also proved the world was round (which he didn’t, Magellan’s crew would do that and the popular consensus among the literate had been that the world was round). But, whatever the accuracy as far as what he was first at, he is credited for opening the door for Europeans, beginning with the Spanish and eventually the English, whose colonies’ descendants became the dominant cultures in the Western Hemisphere. Others see him as being a hero for bringing Christianity to the native population, who before then, practiced a variety of religions, from ancestor worship to those Esoteric religions matching the devotion and wealth of the Catholic Church on scale. For many, Columbus’ journey eventually led to the journey of many of ours which in turn led to us living in the U.S. today. But, it’s the same reasons that he’s also seen as a historical villain in the eyes of many. That to mean, showed what ambitions Columbus had in mind. He was not content to be an explorer, but he wanted to be a ruler of sorts as well. But, the people whom Columbus made contact with did not exist for long after their initial contact. Within decades, they were ravaged by diseases brought by the Europeans of which they had no immunity to. Within decades, the indigenous people of the Caribbean would pretty much be wiped out of existence. Those who didn’t found themselves servants, living lives as servants or concubines. It was a process that found itself repeated by colonists of many flags and languages. Following his first voyage, Columbus was appointed Viceroy and Governor of the Indies. His time as governor was controversial and witnesses own accounts of his barbarism was even much for the time, which wasn’t exactly known for its civility. Columbus was accused of being a tyrant as governor. A report to the Spanish crown had statements from witnesses that Columbus and his brothers, who had joined him in the New World, were rather brutal folks. The witnesses told of man who caught stealing corn had his nose and ears cut off, placed in shackles and was then auctioned off as a slave. Another story tells of a woman who dared to suggest that Columbus was of lowly birth was punished by his brother Bartolomé, who had also travelled to the Caribbean. She was stripped naked and paraded around the colony on the back of a mule, then her tongue was cut out shortly afterward. Columbus’ brutality and mismanagement wound up getting him removed as governor of Hispaniola as well as imprisoned along with his brothers. Eventually, he’d get out and after his imprisonment and explorer years, Columbus would claim that the conversion of the natives was his primary motivation for exploration. But, anyway, he died in 1508 at age 54. Columbus’ legacy as far as the indigenous people at the time not only rested in the colonists that followed him to the New World, but also the diseases that they brought with them. The diseases wiped out more than 80 percent of the indigenous population before they even had a chance to make contact with Europeans. A population of as high as 100 million people were knocked down to few million in what was practically the blink of an eye. Until the European diseases arrived, North America, where we live today, was dominated by city states created by people such as the Mississippians and the land was dominated by agricultural crops. 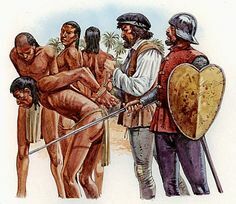 A trade network which ran from Canada to Mexico connected tribes looking to sell their crops, furs or material that they mined. It was not the land of vast unconquered wilderness that we’re often led to believe. But, within a few generations, the city people were gone and nature reclaimed most of North America. No one was able to raze the forests or maintain the roads. Only large mounds, which still exist today, are all that is left of what were once cities of more than 10,000 people. It was an apocalypse for pre-Columbian civilization. Something that humanity had not seen in scale since the Black Death killed up to 70 percent of Europe’s population. So, what does this mean as far as Columbus Day? I guess it depends on what you feel is important — preserving the positive tale of discovery or acknowledging the ugly facts. I’m not sure if you can do both, but I’m sure many are going to try. But, if you are going to celebrate, don’t try to deny or hide the darker aspects of Columbus’ story and don’t act like your entitled not to hear about the misery of millions left in his wake. You can’t hide from facts.